What is Thrift Flipping? Common Questions Answered! What is Thrift Flipping? Frequently Asked Questions Answered! If you’re new to the world of thrift flipping, you likely have a lot of questions. You may be wondering what it is, how it works, and whether it might be something right for you. 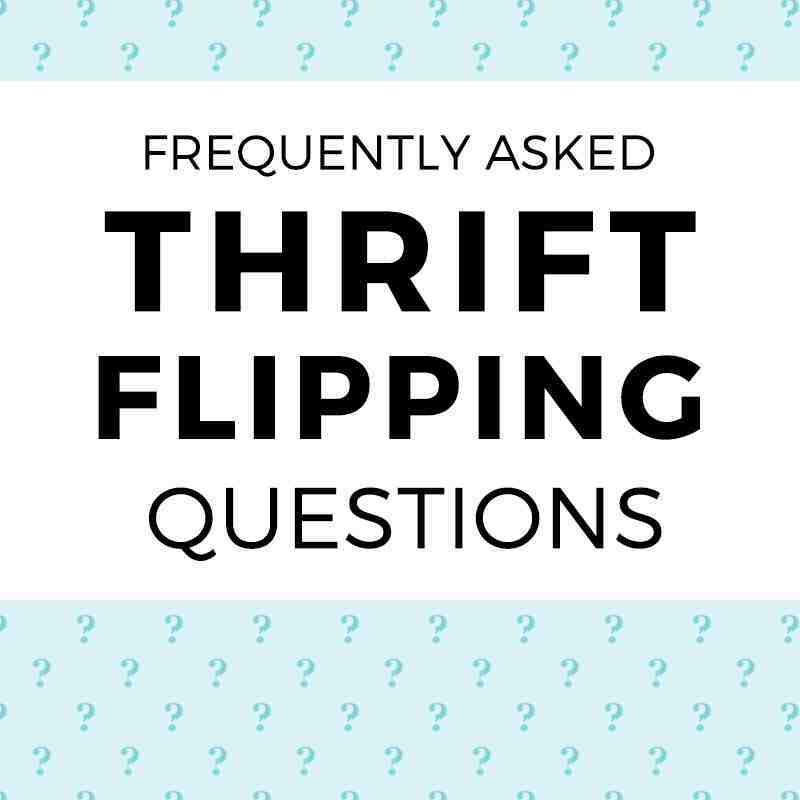 To help you navigate through a lot of misinformation and the various opinions scattered across the internet, I’ve created this post of Frequently Asked Questions About Thrift Flipping to help you understand what the excitement is all about! First things first: What is Thrift Flipping? Thrift flipping is a basically just an easier way of saying “Selling stuff for more than I paid for it”. The word “thrift” has some very interesting history in it’s meaning. According to the Online Etymology Dictionary it originated from the Middle English word “thriven” which means “to thrive”. It also means “prosperity, savings”. In real estate, the term “flipping” means to purchase property as a short-term investment to hopefully make it more desirable to sell for a profit. Thrift Flipping = purchasing something at a savings, and then making it more desirable to later sell for a profit. Many people have found this to be a great way to start their own online business and enjoy the flexibility and freedom of setting their own schedule while making a nice bit of income. Now that we have a basic understanding of what thrift flipping means, you probably have a whole lot of other questions! So I’ve put together this frequently asked questions list to hopefully answer a lot of the questions you may have. Does thrift flipping mean buying things at the thrift store? Contrary to poplar belief, thrifting is not limited to only shopping at thrift stores. While thrift stores can be a source of great bargains and deals, that is not always the case, especially as more and more thrift shops are raising prices. I’ve noticed sometimes for example used clothes can be the same price as a sale on new clothes at the big box stores! You can find great thrifty bargains from a number of sources: yard sales, flea markets, rummage sales, trunk sales, church bazaars, garage sales, estate sales, auctions – and sometimes even online if you are willing to buy in bulk. Isn’t Thrift Flipping Unethical? Poor People Might Need That Stuff! You are a Horrible Person! This is a common question I see come up a lot on a few different forums and group discussions online. Many people think it is “wrong” to buy something at a thrift store because these stores are meant to help low-income people in need afford the stuff they sell. As with most things we often question or disagree with, there are a lot of myths and stigmas related to the role of thrift stores in our society. In reality, thrift flipping helps everyone. You might be surprised to learn that many non-profit donations will actually give the same items you donate to help individuals start small businesses in poverty-stricken areas as a means of earning an income. Soles2Souls is just one such organization which does this using their fascinating micro-enterprise model. Considering there are over 10 million Americans living below the poverty line, in a way, this is a means for many individuals struggling to make ends meet actually be able to afford many things that are important – health care, nutritious food, education, and more. I’ll likely write more on this subject, but here’s the short answer: Do your research on what really happens to your donations. And then go 8 months on an income of $700 with all of your current recurring debts you have right now. Tell me how often do you think you’ll be at the thrift store buying vintage lamps. Would you even be able to afford a house with electricity? Thankfully, there are many independent assistant programs that can help those who are struggling financially. If you are a disabled person unable to work consistently for most traditional jobs, you might find starting your own business is a life saver. Thrift flipping can become a means of income that supports your need for unusual working hours since you may not be able to sleep or require multiple days off a week for your needs. With a little persistence and the right training, a small business is a small risk compared to starving to death or living on the streets and may provide a path to independence for many people. What kind of things can you flip for profits? Most thrift flippers choose to specialize in a certain niche to help them best focus on their business and to create a loyal customer base interested in specific types of things. However, there is NO LIMIT on what types of things you can sell! If you’re knowledgeable about a certain topic already or there is something you are naturally drawn to, that’s usually the best place to start! When you source your items, you look for items you can mark up 4-5 times the cost or more. For example, you are at a yard sale and you notice a vintage game for 50 cents. You buy it, then sell it for $20 online. Your profit? $19.50. Do this enough times and you can easily make a few extra hundred dollars each month. This is just one example. What About Taxes? Proof of Income? I am the last person in the world who should give you tax and legal advice, because quite honestly, taxes make zero sense to me. I would recommend hiring a lawyer or an accountant who specializes in small business taxes where you live. In most cases, this type of side income can be very similar to any other sort of online retail business. No matter what the laws may be where you live, you should always keep a good record of your expenses and your sales. I use a free accounting software called GNU cash, which is confusing to set up – but once in place will give you a good way to pull reports for income. This can help you if you need to provide documentation to your bank, eligibility for public assistance programs or any other agency which requires proof of income. Do I need a website? How do I sell stuff online? While having a website is recommended so you may attract loyal customers as well as drive traffic and interest to your listings, it’s not absolutely necessary. You can sell your thrifty finds on a number of third party sites. Etsy, eBay, Amazon, and RubyLane are just a few popular examples – there are many, many more! It’s also a good idea to be social…websites like Facebook, Twitter, and Pinterest are examples of online social networks you can use to reach your potential customers. What do I need to get started? Do I have to spend anything to start? Getting started is easy. You don’t need very much. You don’t even have to start with buying things – chances are you already have some items in your own home you can start selling online for a profit, which you can then use to reinvest in your business to source more inventory. If you are setting up your own website, you may want to budget some money for a domain name and hosting and a web developer if needed. Basically in a nutshell, you can start your business for less that $100. And that includes inventory! Do You Have Any Questions You May Have About Thrift Flipping? Ask away in the comments section below and we’ll do our best to answer them! I’m glad to hear that Kathy 🙂 I hope all is going well for you. Thanks for your comment, because sometimes the internet is a rough place and knowing that maybe we inspired someone to not give up on a dream helps us stay motivated to keep going when we feel like giving up. How do taxes work for flippers? Taxes will depend mostly on your state and local jurisdiction laws. The Small Business Adminsitration website is a good place to start – your local state or county may also have business resources. Hope that helps!